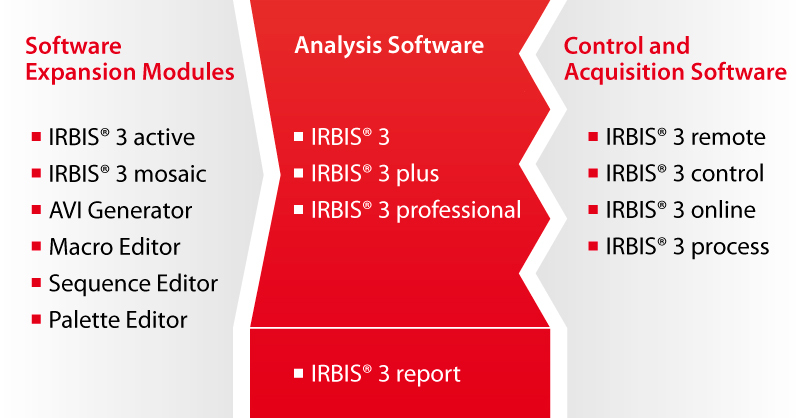 The powerful and easy-to-use IRBIS® 3, IRBIS® 3 plus and IRBIS® 3 professional analysis programs as a part of our product family, offer numerous processing tools and analysis functions focused on the various requirements of individual users. 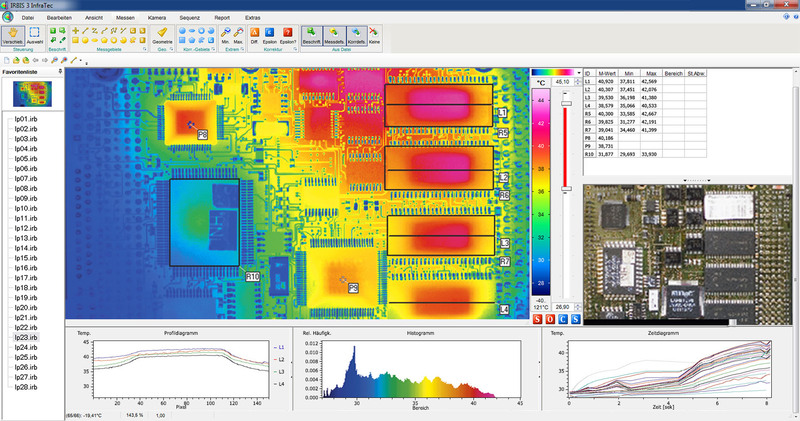 These features allow you to easily create very detailed and informative thermography reports. The modular software concept allows for program configuration based on its intended application and use. In addition to the various software packages, extensions and modules for camera control and data acquisition are also available. Depending on your requirements, the functions of pre-configured software with special additional functions can be extended individually, such as the active thermograpy module, IRBIS® 3 active. This universal module for non-destructive material testing implements active thermography to detect material defects such as delaminations, voids or cracks. Regardless of the respective digital interfaces of the thermographic camera, your camera can be controlled remotely directly through your tablet or PC using IRBIS® 3 remote, IRBIS® 3 control or IRBIS® 3 online. The acquisition of thermal imaging data can be carried out actively or scheduled; even particularly fast thermal processes can be documented with frame rates of up to 13 kHz. Designed for inspection tasks, thermography report software IRBIS® 3 report provides an extremely time-efficient reporting tool using individually-designed or backed templates that correspond to the VdS guidelines. Routine evaluations of even the largest data volumes and their automated processing can be carried out just as easily and quickly as documented reports in PDF format. An extensive range of analysis tools allows for easy and convenient use, including analysis and reporting of measurement scenarios.